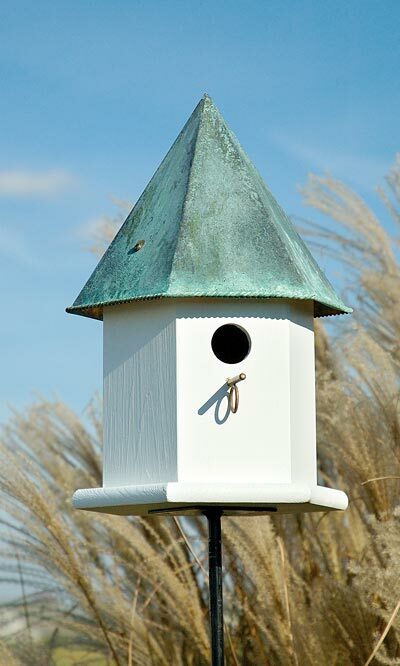 Offer bluebirds a palatial home with the Copper Songbird Deluxe Bird House. This charming, cellular PVC house has a sparkling white tone, creating a striking contrast with the distressed verdigris roof. A delicate braid adorns the bottom edge of the roof, adding beautiful detail to this domicile. A decorative 2" copper perch rests under the 1.5" diameter entrance hole, inviting bluebirds to rest and reside. A notch at the back of the home offers ventilation, and the cellular PVC construction lends durability to the piece. Connect the octagonal base of the home to a post and place it in your yard to invite in avian tenants. Add style to your bluebird trail with this Copper Songbird Deluxe Bird House. Made in the USA.